Beirut- Syrian Opposition factions continue to express growing fears of what would become of the Kazakhstan-held Syria peace talks, scheduled for Jan 23. Ahrar al-Sham, an opposition group in Syria, officially announced that it would not be partaking in the negotiations at the Kazakh capital, Astana—yet reaffirmed its support to opposition factions that would be participating at the deliberations should an agreement be brokered to the best interest of the war-torn country. The Syrian Opposition will be represented by a delegation of 25 people, an opposition source told Asharq Al-Awsat. 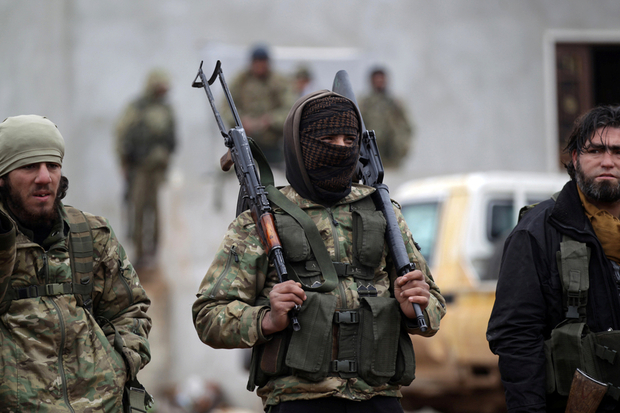 Ahrar al –Sham said that it would be standing out the negotiations given that the regime continuously violated the ceasefire in the Wadi Barada area of rural Damascus. More so, the group disagrees with Russia presenting itself as an insurance policy broker for the people of Syria, knowing that in and of itself have been pounding opposition areas with its air power. Ahrar al-Sham’s rejection was chiefly driven by the fear of schism ripping deep into the group’s entity, promoting dispute against the ex-al-Nusra Front, now known as Jabhat Fateh al-Sham, expert on extremist groups Abdul Rahman al Haj told Asharq Al-Awsat. Adding to the mystery engulfing the Astana peace talks’ agenda, especially as incoming data on the strategy in which the regime representation was established casts major doubts and fears that the negotiations are a façade staged to keep authoritarian Bashar al-Assad in power. The regime maintained the same foundations on which the Geneva delegation was based on, suggesting that the Astana talks would not be limited to realizing a military ceasefire but also extended to political talks, unlike what Russia has claimed. “As of the beginning (promoting the Astana talks), after the continued persisting to bypass the High Negotiations Committee, and ongoing pressure inflicted upon opposition factions, we fear of an agreement being brokered at the expense of the opposition,” a Syria opposition source told Asharq Al-Awsat. “Many strings are being pulled against the opposition, cracking down on their position—especially that Turkey has hinted to halt all supply lines and shutting down borders should the opposition not attend the Astana talks,” the source added. The opposition source further explained that fears point that the meeting might already be built on a prestruck agreement brokered between Turkey and Russia, offsetting the Geneva statement and bringing about a new roadmap that ensures Assad’s prolonged stay in power.